Followers of my blog may have noticed quite prolonged exchanges in the comments section between me and Peter Martin. We are both amateur economists so this kind of exchange helps to sharpen thinking, absent an academic or journalistic environment. In order that I might understand Peter’s critique better, he suggested that I view this video of Stephanie Kelton, professor of economics at the University of Missouri – Kansas City. Ms Kelton advocates a system referred to as “Modern Monetary Theory” or, sometimes, “neo-chartalism”. (I will use “neo-chartalism” henceforth as it is easier to write; the “neo” is needed because I think a lot has been added to the basic idea of chartalism). When, as I recently blogged, mainstream macroeconomic thinking is in a sad state, it behoves us to look at those challenging it. This is an interesting idea to pick apart. The core idea is in fact quite an old one – the original chartalism dates from 1905 and its ideas can be traced back further than that. It is that money is a state artifact, and as such the state has much more latitude in its management than conventional wisdom allows. This is in opposition to the more conventional view that money evolved primarily as a means of exchange to facilitate a market economy, and that the state’s powers to manage it must be constrained or it will be devalued. It is also contrasted with an idea of money that is intimately linked to precious metals (“metalism”), which is a bit cranky these days. The chartalist view is that money’s primary function is as a voucher with which to pay taxes. It stems from the need of states to commandeer resources to fulfill its functions; this it does through the imposition of liabilities on citizens, which we call taxes. It uses currency values to denominate these liabilities, and then puts physical currency into circulation so that they can be settled. It does this in the first instance by paying its servants and suppliers in this currency. Since everybody needs currency to pay taxes, it quickly evolves into the primary medium of exchange for the whole economy. This allows a banking system to develop for the provision of credit, which in turn facilitates the evolution of money from precious metal coins, to vouchers for precious metal, to fiat money not backed by anything at all. The utility of fiat money, which people not so long ago would have been quite unable to comprehend, is perhaps the ultimate vindication of chartalism. Money is simply what the state says it is; it needs no greater authority than that. And it follows that the state need never run out of money, because it can create all it needs. This narrative of money is compelling. Historical research comprehensively refutes the idea in old economics textbooks that money somehow evolved from a barter economy. Indeed the core chartalist narrative of money is now so widely held that it is fair to call it mainstream. I doubt that most modern economics textbooks repeat the barter myth. That states can create all the money they need (usually, and misleadingly, called “printing” money) is old news, though, and, indeed, has been an enduring theme of economic debate since the hyperinflation that followed the First World War in Germany and Austria. The chartalist view on this is distinctive: the act of the state creating money does not of itself devalue it: that depends on the context in which it is done. The problem in post war Germany and Austria was that reparations were making unbearable demands on these states. But this narrative tells you little by itself. It is what neo-chartalists build on this foundation that sets them apart from other economists. My main disappointment with Ms Kelton is that she spends too much time revelling in the brilliance of the initial insight (including a very useful idea of a pyramid of exchange, which explains why local currencies are unlikely to succeed), and too little in explaining where she thinks it leads and why. In trying to explain it I will identify ideas that are implicit in what she says, rather than part of an explicit structure. The next key idea, and the one that makes neo-chartalism truly distinctive, is that fiscal and monetary policy should form a unity. The best way of putting more spending power into an economy is for the state to loosen fiscal policy – to spend more or tax less; the best way to cool an economy down is to tighten fiscal policy. Fiscal policy directly affects the amount of money flowing in the economy. And a looser fiscal policy can always be supported by the creation of more money. This is very different from the pre-crash consensus, which suggested that fiscal and monetary policy should often pull in opposite directions – with only a marginal role for fiscal policy at all. And even after the crash the British coalition government had a policy of tight fiscal policy balanced by loose monetary policy. Chartalists say this was a mistake: fiscal policy should have been kept loose up to the point where economic capacity was fully utilised, with monetary policy providing support as required; only then should the brakes be jammed on (although may impression is that they are reluctant to admit that the brakes should ever be jammed on – I may be being unfair). Here too, I think that neo-chartalists are onto something. I was coming to a similar conclusion, albeit by a different route: the application of the Mundell-Fleming model for open international economies. Ironically Mundell-Fleming is an old-school idea, and regarded with suspicion by neo-chartalists (for example Professor Bill Mitchell of the University of Newcastle, NSW, a leading chartalist). Mundell-Fleming suggests that a floating exchange rate neutralises fiscal policy; but not if it is harmonised with monetary policy. Under a fixed exchange rate system, monetary policy automatically harmonises with fiscal policy, and even amplifies it. The neo-chartalists are surely right that monetary policy by itself is a very inefficient means of managing demand compared to fiscal policy – but it can be an important adjunct to it. Perhaps the difference between me and the neo-chartalists is that I think the aggressive use of fiscal policy leads to state management of exchange rates,which is not, incidentally, necessarily a fixed exchange rate, and certainly not a currency union. But that is a discussion that needs to be taken elsewhere. A third key building block of neo-chartalism is that a powerful, fully sovereign state is a force for good. Ms Kelton regards the sacrifice of sovereignty involved in the creation of the Euro with near disbelief. Why on earth would anybody want to do something so stupid? This marks neo-chartalism as a political idea of the left, and its faith in a strong state as the instrument of democratic will. The right view a strong state with suspicion or hostility – as something that uses its power to escape democratic control and further the interests of the state sector at the expense of everybody else. To see the importance of this aspect of the debate, you only have to look at Zimbabwe, where the state’s ability to create money has been a critical way for Robert Mugabe’s regime to retain power; in order to curb the political excesses of the Zimbabwe government it was necessary to adopt the US dollar as currency. Now that Mugabe is on top, he is trying to create his own currency again – but to secure his political status, not to advance the Zimbabwean economy. Strengthening the state’s power on money creation will place a real strain on democratic institutions. Things look all very easy when the state needs to create money to stimulate: but can it be trusted to reverse course when the economy overheats? History suggests that governments tend to deny that an economy is overheating until long after inflation has set in. The Argentine government of Cristina Fernandez even went as far as politicising the state statistics bureau to cover up inflation statistics. In Britain we may remember the stagflation of the 1970s, or, more recently, Gordon Brown adjusting his fiscal rules just when they called for tightening. I think this is a big problem, but not necessarily an insoluble one. Interestingly there is a divergence of opinion on the radical left here. People such as the former Greek Finance Minister Yanis Varoufakis think that there is virtue in the idea of a supra-national system for the management of money – a sort of new Bretton Woods – that would curb a state’s power to create money. It is no coincidence that this view comes from somebody used to the challenges of managing a small country, whereas Ms Kelton hails from the USA, which in effect has its cake and eats it by controlling a world currency while remaining a sovereign state. A optimal private sector (i.e. the aggregation of net private consumption and net business income) should operate at a surplus – i.e. they should be net savers. Excessive private sector debt follows if they are net borrowers, and that is destabilising; public debt is much safer because the state can create the currency to repay it. The private surplus must be balanced by either or both of an external surplus (e.g. net exports) or a public sector deficit. Since not all economies may have an external surplus, this means that it will often be the case that a permanent budget deficit is perfectly healthy (with the US and UK economies being examples). An inappropriate budget surplus could lead to a private sector debt boom – which is what happened to President Clinton’s USA in Ms Kelton’s view. Sovereign states with control over their own money have nothing to fear from an external deficit – which implies that the state or private citizens must obtain funding from foreigners. The key is that the country must borrow in its own currency – so that it can create the money to repay it. That a country might be forced to borrow in foreign currency is a major weakness in the whole edifice, I think. It is far from clear why exporters from surplus countries should always be in a weaker bargaining position than importers from deficit ones, and so be forced to accept the importer’s currency. The developed world is suffering from a chronic lack of demand. Neo-chartalists follow pre-crash neo-Keynesians in believing that the key indicator of excess demand in an economy is inflation (as opposed to asset prices or trade deficits). And since inflation does not appear currently to be a threat in any major economy, there must be plenty of scope to expand fiscal policy. Neo-chartalists do not appear to take seriously the idea that their may be darker forces at work in the economy, reducing economic potential – something that I have long argued. Ms Kelton produced a graph to illustrate where the US economy could be by projecting forwards its growth rate from before the crash – something guaranteed to leave me spitting with fury! They also seem to have little truck with the “Austrian school” idea that a certain degree of slack is required in an economy in order to sustain the forces of creative destruction – and that recessions may be positively beneficial. In summary: the neo-chartalists are re-writing the conventional wisdom on what money actually is, and have useful things to say about the role of fiscal policy. But beyond that my first reaction is that it is a modest idea that has pretensions beyond itself. It seems applicable in some contexts, but not as a general rule. And yet neo-chartalists are a valuable part of the dialectic from which a new economic synthesis will form. They do not deserve the disdain with which conventional economists treat them. Indeed many of the ideas I have briefly discussed here are a well worth a revisit. I want to dig further into to the topics raised in this blog: the role and management of state power; the relationships between public, private and external balances; managing an economy in the wider world; and demand management vs deeper economic forces. A discipline that still reserves a place for real business cycle extremists, surely has a place for the new monetarists too. Thanks not dismissing this idea out of hand. It takes a while but once we acknowledge that the economics of a currency issuer isn’t the same as a currency user then everything starts to make sense. Just one point: It’s Prof Bill Mitchell at Newcastle (NSW) Uni. I don’t agree with him on everything, either, but I do believe he offers a refreshingly different narrative on our current economic woes. Then there this by a Warren Mosler. He’s no lefty, and he’s made lots of money in finance, but he comes to the same conclusions. I don’t think it’s the actual exporters who are in a weaker position. Let’s look at the situation from the POV of a Chinese company, let’s call them Wang Wei, who are keen to export their wares to the USA. If we ask Wang Wei for a quote they’ll likely give it is US$. They probably have a US$ account at their local bank. But they don’t actually want that many US$ . They need Yuan or Renminbi (RMB) to pay their workforce. So they trade their earned US$ for RMB at the rate of $0.15 each. Wang Wei don’t care much after that. They’ve sold their products, they’ve been paid in dollars and they can then change them as they like for RMB. The problem (if it is a problem) ends up at the Chinese central bank. The People’s Bank of China. They end up with more dollars than they can use. There are lots of companies like Wang Wei all accumulating a surplus of dollars. So they buy up US$ securities with them and issue RMB, from thin air, to satisfy the needs of Wang Wei and other exporters. They are thought to hold between 3 and 4 trillion dollars worth of US Dedt and it’s increasing every year. The good thing about that from the Chinese POV is that it gives them very deep pockets. No speculators are likely to take on the Chinese government on the Forex markets. The bad thing is that they are accumulating IOUs that they can’t spend. So what’s the point? That’s the question I would ask. But it’s entirely their choice. If they don’t want those dollars they should just sell them and balance their trade or even run a deficit for a time. The German Bundesbank did exactly the same thing when it used the DM. It would create DM (again by the so-called printing press) to satisfy German exporters and hold down the value of the DM. And, if we believe what we are told, it did all that totally independently. The German Govt had no say in the matter! For that to work the central banks need to play ball. They have been happy to build USD assets, and to a lesser extent EUR too, and a bit GBP. they can’t build up RMB and would treat S American currencies very warily. If somebody pays you in foreign currency, you have no automatic right to have it changed into your own. If the Greeks dropped out of the Euro they would find it hard to bill in new Drachma. Creditors would be unpersuaded by the argument that “Don’t worry, we can’t default because we can print all the Drachma we need” unpersuasive. Yes of course. They’ll do what they are told by their Government. As always! You and I could but not the PBOC! That would be a political decision by the Chinese Govt. Do they want to run a trade surplus with Brazil? If the Greeks dropped out of the Euro they would find it hard to bill in new Drachma. ?? No country can become wealthy just by creating currency. A country in the Sahara, having little or no mineral reserves, and difficult agricultural conditions is likely always going to be a poor country. Any country can only survive on what it can produce, what it can trade with others and what others are prepared to lend it. Bearing in mind that the lending isn’t necessarily requested lending! If I buy a US Treasury bond, or even if I keep US$ in a piggy bank, I’m lending the US government money even though they haven’t asked for a loan. That lending forces up the value of the dollar causing the US to run a trade deficit. The government then needs to deficit spend to keep the economy functioning at close to full capacity. Greece doesn’t have the industrial base of Germany but neither is it in as difficult a position as, say, Chad or Niger. People would like to go to Greece on holiday for example. But there is obviously something very wrong with the Greek economy with unemployment levels as high as they are. 25%+ the last time I checked. If they were able to float their currency its likely that there would be, at least initially, few takers for Greek bonds (both internally and externally) in New Drachma. That would just mean that their trade would balance and their economy would be running close to full capacity without the Government having to deficit spend. In fact they shouldn’t deficit spend if no-one else wants to save. That would just cause inflation. It wouldn’t be hard to bill in ND. Anyone wanting to buy anything, like a holiday Feta Cheese, or Olives or whatever, in Greece would simply trade with Greece in the same way as anyone else. The ND would have an exchange rate just like the currency of every other country. Would the graph have looked anything like this? 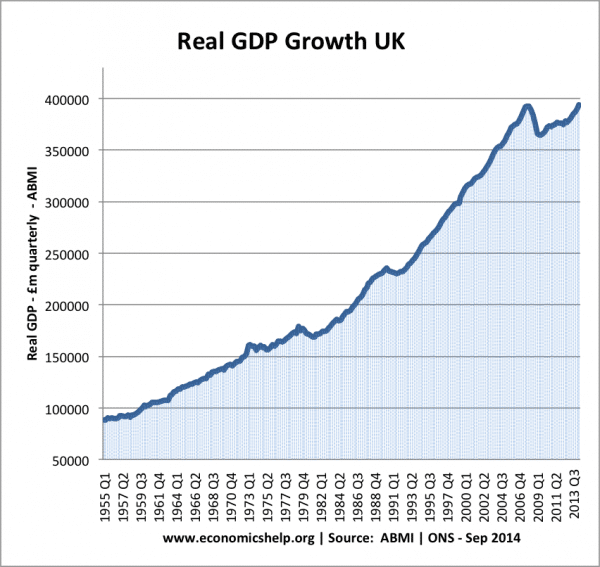 Although this is a graph of the UK’s historic GDP which is probably more dramatic than a similar graph for the USA. It should be noted that this is for total GDP rather than GDP per capita. There’s been quite an increase in the population since 2008. So there’s something gone very wrong since 2008. It might be said that economies cannot grow forever due to lack of real resources such as minerals and energy, and that there’s a demographic problem in the UK which will have an effect on growth. But, if they were the reasons for the decline why has the change been so abrupt? Of course we can’t prove anything with absolute certainty in economics, but surely the most plausible reason for the reduction in GDP, compared with the previous trendline, must be the lack of aggregate demand in the economy? So why the “spitting with fury” ? There is certainly something odd, but in my view you don’t get very far by staring at lines on a graph – you need to appreciate the context. Now the combination of adverse trends that I believe have been affecting the UK economy (and the US one in a different way) started well before 2008. In my view, the UK economy was being pumped up beyond its potential in a bubble economy. So the crash included a strong element of correction. If you look at the graph with that idea in your head, then that looks completely plausible. From about 2005 the graph keeps going up when the gradient should be declining. You can see something like this going on at the end of the 1980s. “Spitting with fury” because I’ve been saying this for years, and don’t like it when people don’t take into account the bubble idea as a plausible alternative hypothesis. The first person to have me spitting with fury like this was Martin Wolf of the FT a couple of years after the crash – though at least he felt the need to address the alternative hypothesis, before dismissing it very high-handedly (not mentioning the expanding current account deficit, one of my prime pieces of supporting evidence – along with the self-evident nonsense going on in the finance sector, where I had recently been working, and an added bit of nonsense in north sea oil – if you take those two sectors out, you get a much slower growth rate pre 2008). Nowadays he too talks about how the growth of potential has slowed down due to demographics and technology though he has as yet picked up my point about deteriorating terms of trade as Chinese wage-rates accelerate. According to your interpretation of what I’m arguing! If you live in London or the wealthy SE of England then you’ll possibly be of the opinion that anyone who genuinely wants to work can find something. There’s an excess of demand for housing and road space for example. Competent Plumbers, Electricians, car mechanics can all be hard to find. I’ve never lived in Munich or Amsterdam but it’s likely that there’ll be the same siituation there too. So just ramping up aggregate demand in the UK and the Eurozone is likely to produce higher than acceptable levels of inflation in the more prosperous regions. So just when the poorer regions might be starting to feel some benefits from a fiscal stimulus the brakes will have to be applied to control a general inflation. So the deficit spending needs to be targetted to where it won’t cause inflation. The “chronic lack of demand” isn’t general. Just regional. Next Next post: The shape of Brexit is becoming clearer. Don’t write Theresa May off.